Smartphone Aane ke bad hamare kai work easy ho gaye hai. Android Application se Sabhi work aapko Ab Possible Lagane Lage hai. Ham Internet pe Jyada Time Social Media Ka Use Karte Hai. Isame Facebook aur whatsapp Dono Popular hai. is Article me 1 mobile me 2 whatsapp chalane ka tarika – Tricks Batayi Gayi hai. ise follow karke multiple WhatsApp account use kar sakte hai. kabhi to aapko laga hoga ki shayad mere pas 2 WhatsApp account hote. 2 facebook account ko to aapne shayad use kiya hoga. but WhatsApp ke do account banana aapko impossible laga hoga. lekin Hindihelpguru aapko kai method Provide kar raha hai. jisase aap apane android smartphone me 2 whatsapp account ek sath use kar payenge. Isake Liye Aapke pas android Phone, extra Mobile Number, aur internet data chahiye. Google play store me aapko kai aap mil jayegi jo multiple account ko Use karne ki services provide karte hai. mai aapko popular apps provide kar raha hu. isaki madad se aap 1 mobile me 2 whatsapp chala Payenge. 1. Sabse pehle apne phone ke play store me jaaye aur Parallel Space search kijiye. App search karne ke baad is mobile app ko install kijiye. 2. App ke install hone ke baad app ko open kare. Ab app menu me se Whatsapp ko select kare aur neeche Add to Parallel Space button ko dabaye. 3. Ab country me India option ko select kare. Iske baad neeche row me apna second mobile number type kar green arrow button ko dabaye. 4. Ab OTP code type kijiye. OTP code daalne ke baad aapka doosra whatsapp account verify ho jaayega. Congrats aapka doosra whatsapp account ban gaya hai. 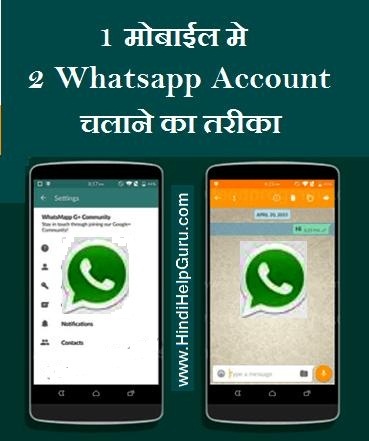 Enjoy ( Dual ) 2 whatsapp account ….!!! Sabse pehle Whatsmapp app download kijiye. Whatsmapp download kar lene ke baad app ko install kijiye. App ke successfully install ho jaane ke baad app ko open kijiye. Ab apna secondary mobile number daale jisse aap doosra whatsapp account banan chahate hai. Mobile number daal kar Enter button dabaye aur OTP code aane ka wait kare. OTP number aane ke baad OTP code daal kar whatsapp account ko verify kijiye. Bas, Aapka Kam Ho gaya ..!! is tarah bhi aap 1 Mobile me 2 Whatsapp Chala Sakte hai. Is Method Se Aap lolipop version me bhi sabhi socila site account ko Multi User account setup se Use kar Sakte hai. 1: Add Multi-User in Android Lollipop-Based smartphone. For this, just go to Settings and click on Users and then Add User. 3: Switch to the New User by pulling down the notification bar and clicking on New User icon. 4: Once turned to New User, you will be provided with an all new phone interface with default phone settings. 5: Now, Install WhatsApp in the New User Mode. 6: Once WhatsApp is downloaded, enter all the details, and that is it. 7. Anjoy…!! 2 Whatsapp Account for 1 Mobile . Aapko Article Kaisa Laga Jarur bataye. 1 Mobile me 2 Account Chalane Ka tarika dosto ko Bhi share Kare. Koi Problem hai to Comment me Jarur Bataye. HindiHelpGuru facebook Page Like Kare. Daily Updates – tricks pane Ke Liye Email Se Subscribe Kare. 1. Jo m first account m chat kru wo 2nd m nahi honi chaye …..
2. Jo 2nd m kru wo 1st m nahi honi chaye…ok..! 3. So how can we Do this Process …. 4. When u have so Please suggest because m suffering….from many related this issues. ek contact Number se ye sabhi Option possible nahi hai. Aapka Sawal Kuchh Samaj Me Nahi Aa Raha hai. Aap Aadhaar Card Related lekh Padhe. Aap comment box ke niche ” Notify me of new posts by email.” ka Option hai waha Tik kar de. email se pata chal jayega. Aapki comment Muje Pasand Aayi. kyuki jio ke aane se mai comment ke javab dekhar thak gaya. aur sabhi ke same saval rahte the. Kaise use kr sakta hu. blogger me settings ke option me hota hai aur wordpress me Discussion me hota hai.